I recently saw the very impressive exhibition at The Gallery of Modern Art in Brisbane called 21st Century: Art in the First Decade (includes film, photography installations, sculpture, painting and drawing). I sat in a darkened room mesmerised by a five-screen video installation, which seem to be about a treacherous sea voyage – tragic, worn out looking passengers on a small old boat, carrying nothing but themselves. I had entered this exhibit without first reading the information tag that accompanies each work and apart from recalling the plight of Australia’s asylum seekers and some of the terrible boat tragedies that have occurred, I was also wondering about other lands. The small, wooden fishing boats and the coastline looked very much like Sicily, the refugees could be North African, and the content relevant to Sicily’s present situation on Lampedusa (Isola di Lampedusa), an island in the Mediterranean Sea, part of the Province of Agrigento. And sure enough, it was Sicily – I recognized the stairway of one of the hotels in Palermo I had once stayed. This very moving and deeply relevant installation is called WESTERN UNION: Small Boats and it is by Isaac Julien, an English artist and filmmaker. It was filmed in 35mm and transferred to video – it is an allegorical account of the hazardous sea journeys of North African illegal immigrants who often wash up dead on the shores of Sicily. I found this photo ( above) of that amazing staircase and although Julien’s installation left me feeling sad, I also contemplated the beauty and excitement of Palermo: the eclectic architecture, which reflects several ruling cultures (Norman, Arab. 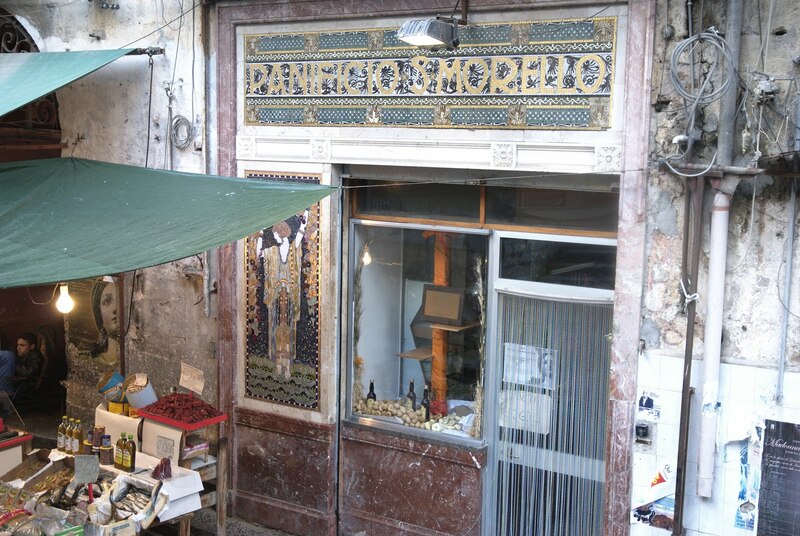 Baroque); the street markets held in long, maze-like, narrow alleys, the piercing shrills of the sellers and the extraordinary array of produce. It seems appropriate to have a recipe which reflects the of taste and fragrance of some of the cuisine of Palermo. I have chosen sardines. 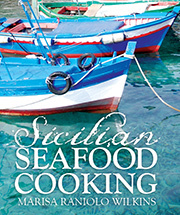 There are many Sicilian recipes for baked, layered sardines and not all originate from Sicily. 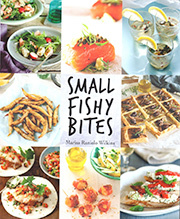 In one of Ruth Rogers and Rose Grey’s Cookbooks, River Café Two, they call their layered sardine recipe: Strati di sardine (from strata, a layer). Their recipe is with breadcrumbs, zest of 2 lemons, pine nuts, extra virgin olive oil, chillies and parsley. 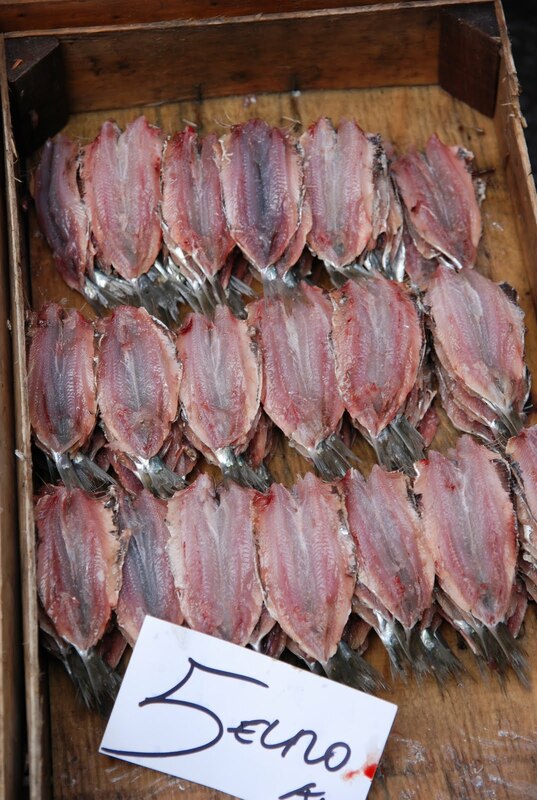 In their recipe the sardines are not fried beforehand. My recipe also has raisins and includes juice of a lemon and an orange and I call my layered sardines a Crostata di sarde. The stuffing is very similar to that of sarde a beccafico, but in this recipe there is no rolling of the sardines – much less arduous to prepare. A crostata is a tart and the sardines are topped with breadcrumbs; this forms a crust when baked (the word for crust in Italian is crosta). There are plenty of sardines in Australia, they are wild-caught and mainly fished in WA near Fremantle, Hervey Bay in Queensland, and increasingly in South Australia – this makes them available for most of the year. This crostata can also be eaten cold. Mix the breadcrumbs, parsley, garlic, zest, pine nuts, seasoning and raisins together. Add a splash of olive oil. Fry the sardines in some of the very hot oil, just enough time to crisp the skin. Do not overcrowd the fish in fry pan or they will poach rather than fry. Drain on paper and set aside. Oil a large baking dish that will accommodate all of the ingredients in three layers. Line it with 5 bay leaves. Begin with a layer of the breadcrumb mixture; add a splash of oil next a layer of sardines (not overlapping and skin side up) then a splash of juice. Cover the sardines with a sprinkling of the breadcrumbs mixture, and follow with a splash of olive oil. Repeat with another layer of sardines and juices, finishing with the breadcrumbs and another splash of oil. Insert more bay leaves between some of the sardines. Bake in a preheated oven (200°C) for about 20 minutes until a crust forms on top.